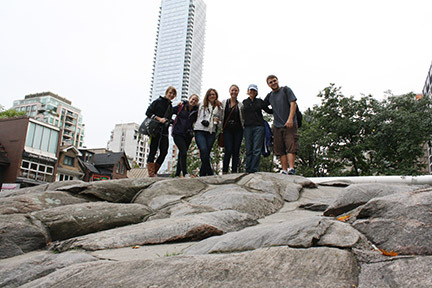 The LAR 648B class, taught by Dr. Anne Beamish and supported by a K-State President’s and Provost’s Academic Excellence Award, traveled to Toronto this fall. 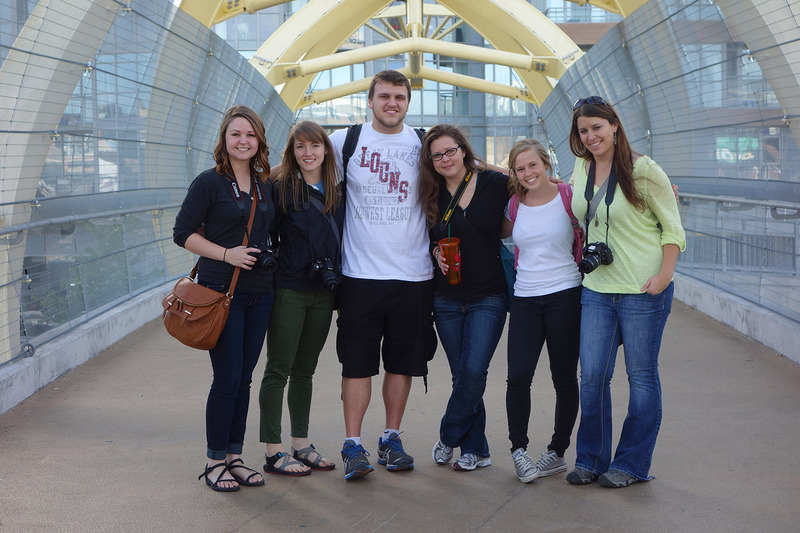 Read about the experiences Ashley Brewster, a 4th year MLA student, had on the trip. What class were you in that attended the field trip? We visited Toronto for LAR 648B. This is the course number for our World of Night Specialization Studio. We visited so many great sites and projects while we were there! The first full day (Thursday) that we were there, we visited the CN Tower, the Watertable, walked along the Harborfront (which had multiple sites along it), visited the Music Garden, went to the St. Lawrence Market, visited James Park, walked through the Sculpture Garden, saw the Courthouse Square, stop at the Cloud Gardens, and also spent some time in Younge-Dundas Square. It was a very busy day, but we loved and enjoyed every minute of it! The second day (Friday) we were in Toronto, we went to the Kensington Market, visited Chinatown, walked down Queen Street, and visited Nathan Philips Square. On the last full day (Saturday) that we were in Toronto, we visited Yorkville Park, went to Corktown Common, walked through (and played!) at Underpass Park, and spent the afternoon in the Distillery District. The Nuit Blanche Festival was held later that night. We left for Toronto on Wednesday, Oct. 2 and returned to the States on Sunday Oct. 6. While we were on our trip, we had the opportunity to see so many new and amazing projects. (I listed above what we saw on each day) Professor Beamish did a great job at planning the trip and making us well aware of everything we would be seeing before we even left. She provided us with a very detailed itinerary for each day and allotted enough time each day for us to be able to see all the respected sites. Each morning, we would set a time to meet after getting ready and grabbing breakfast. When we would meet in the morning, Anne would talk to us about what the plans were for the day and we would all head out together! As the days went on, we would continue to tour and sight see. Most of the time we would all grab lunch as a group and then split off for dinner. Each day was a new adventure! The trip to Toronto related directly back to our World of Night Specialization Studio for many reasons. One of the main purposes of the trip was to expose us students to the physical design and social use of urban public spaces in regards to streets, plazas, and parks. This was one aspect of landscape architecture that we had been, and are continuing to, focus on throughout the semester. 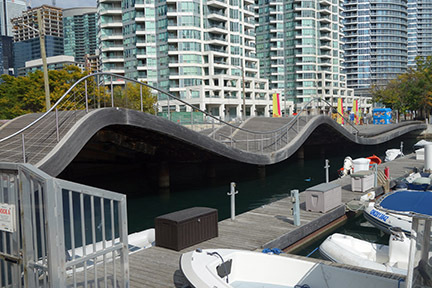 We were able to see great examples of successful urban public spaces while touring Toronto. Another main reason that we took this trip specifically was to document the Nuit Blanche Festival. Nuit Blanche is a nighttime celebration of contemporary arts that has taken place in Toronto for eight years. 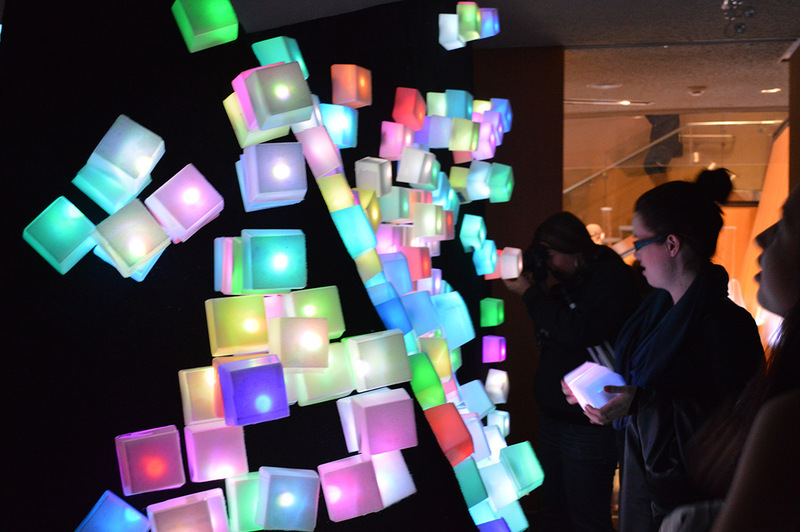 The focus of the World of Night Studio was on night lighting in landscape designs, so experiencing and documenting at Nuit Blanche was a great way for us as students to see an array of ways that life can be brought to public spaces through the use of light. It was also a great way for all of us to get practice of nighttime photography, which was another main learning objective for the World of Night studio course. My favorite part of the entire trip was the Nuit Blanche Festival. It was unlike anything I had ever been to or experienced! Toronto was so alive! There were so many people in the city on Saturday night and everyone was so excited. It made me ten times more excited to be there with that many people, just knowing how popular this event really is. I loved exploring the city night and going from one light installation to the next while getting some really good night photography shots. 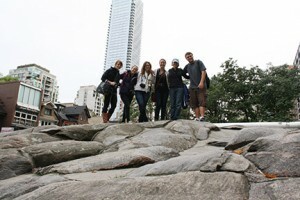 One thing that I learned about the area that we visited was how diverse Toronto is! I had no idea! I come from a really small town in southern Missouri where diversity is rare, so seeing how many different groups of people live in one city was amazing to me. 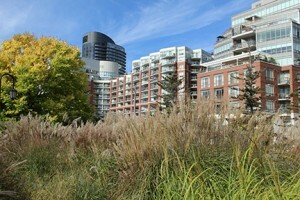 My favorite site that we visited was the Corktown Common. This project was designed by Michael Van Valkenburgh Associates and was only opened in 2013. I thought this project was awesome because the site that was chosen for the project was an abandoned post-industrial area. Michal Van Valkenburgh Associates have transformed the site into an amazing park space that attracts many different age groups. There are well defined walking paths, small gathering spaces, playgrounds for children, and an iconic pavilion spaced used for larger gatherings. It was also very intriguing to actually be able to visit a project that was designed by such a successful and well-known landscape architect. I can’t say that there was one particular person that I met while on the trip that has inspired me, but I have definitely been inspired by the artists that had light installations at the Nuit Blanche. The installations that were displayed in Toronto were so creative and unique! I use many of those installations as precedents and examples for my projects that I have been working on in studio. I always think back to the lighting projects we saw in Toronto and use them as precedent studies and examples for the projects I am working on in studio. I also was able to learn a lot more about night photography while we were documenting at Nuit Blanche, so that has been a tremendous help throughout the semester! All together, the trip went very smoothly and was fun, but yet educational all at the same time! It was a great experience that I am happy I had the opportunity to partake in. Memories from class trips are some that I will never be able to forget! Ashley Brewster is originally from the small town of Ste. Genevieve in Missouri and is currently a 4th year graduate student in the College of Architecture, Planning, and Design at Kansas State University studying landscape architecture. She has had the opportunity to travel to various cities around the United States and also in Scandinavia. After graduation, she would love to end up in the Chicago or Denver area.